The best way to interrupt the carefully cultivated experience of hanging out at a hookah lounge is the heat management. 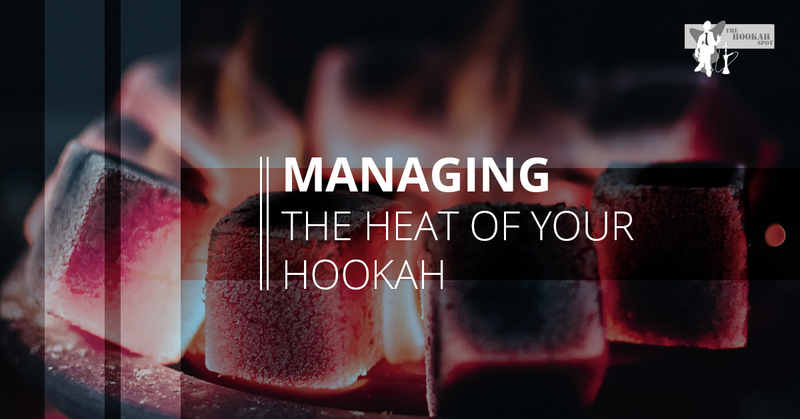 Unfortunately, the wait staff attending your hookah smoking needs will be hard-pressed to be able to tell when the coals are getting too hot or cold. Although Hookah Spot strives to provide a completely relaxing experience without any of these speed bumps, heat management is a necessary evil. The main sign of an overheated bowl is the taste of the hookah smoke. To avoid the literal headache of poor tasting tobacco that’s not cooled properly, the coals will need to be rotated from time to time. Your hookah bowl will be accompanied by a pair of tongs that will allow you to move the coal to a different area on the bowl to make sure the shisha burns evenly and provides you with the best flavor profile. Checking the bowl occasionally to see if there is smoke rising out of the top of the bowl will prevent your shisha from burning. If you do see smoke, be sure to rotate the coals. If you taste the smoke becoming harsher, you should try removing a coal from the bowl for several minutes to allow the tobacco to cool down before trying the smoke again. As you know, the hookah industry is full of connoisseurs who are always creating new ways to smoke shisha with the best possible results. The first device for heat management was called the Kaloud lotus. It works better than tinfoil, manages heat, and acts as a wind cover. It will produce far fewer charcoal particles in your smoke and provides a superior taste for your shisha. A much more simple device goes by the name of the “Flavor Saver.” It is an aluminum strip of metal fashioned into a spiral that you would place on top of your tinfoil. It provides space between the coals and tinfoil that makes your flavor last much longer. To avoid heat management blunders in the first place, never place coals directly in the center of the bowl. Once you’re toward the end of the session, feel free to place the coal in the center of the bowl, but not in the beginning. Coal puts off heat in every direction, so the center of the bowl will always be receiving heat from your coals. If the coal is in the center, you’re putting too much heat on the tobacco and it will burn quickly and tarnish the taste of the shisha. Placing coals in the middle can also cause the taste of the coal to leak into the shisha smoke. After your coals burn down to embers, they’ll be emitting far less heat and you’ll need to add fresh coals to keep the temperature of the bowl consistent. If you’re adding coal to the bowl, it’s best to place the new coal across the bowl from the embers, to apply heat in a more passive, but effective, fashion. You might try putting a portion of the coal off the edge of the bowl to heat the bowl more slowly. This allows for a more even taste and burn of the tobacco and significantly limits the chances of burning it too quickly. For the safest form of maintenance when dealing with charcoal ash, scrape or lightly blow the ash off of the tinfoil. Very little ash will manage to fall through the holes of the foil or screen, and it won’t fall any lower than the first layer of tobacco. The tiny amount that will fall through will not affect the flavor or even the texture of your smoke. To avoid excess ash at the end of the session, try picking up the coal from time to time to knock off the accumulating ash. However, this is merely one way of many that you can handle smoking shisha, experimenting is encouraged, whatever enhances your experience is welcome. Try a wind cover to slowly heat up your bowl and apply a more even taste, or to raise the heat of a bowl that’s cooling down. While these decorative covers work wonders outside protecting hookah smokers from ash. They can also serve a heat maintenance purpose when indoors. Hookah Spot is the hookah lounge near you that introduces the best shisha experience. We proudly serve in-house mixed flavors with the Tangiers shisha tobacco. If you’re interested in a relaxing yet fun time, head to our hookah lounge. If you fall in love with a flavor or the activity itself, we offer a hookah shop that sells our hookah lounge products. Our shop features shisha mixes, accessories and more. Make your next Friday night in Columbia memorable at the Hookah Spot.